My 4-year-old REFUSES to eat anything that is the color red — no red apples, tomatoes, red peppers or even pepperoni on his pizza. He didn’t used to care what color his food was, but within the past couple weeks, he’s taken a distain for red foods. Is this normal? Little Girl refusing to eat healthy lunch/snack of fruit and drink her milk. Photo: Getty Images. As frustrating as that may be for you when planning family meals and deciding what to feed your little one, picky eating habits are considered a normal part of a child’s development, according to health professionals. 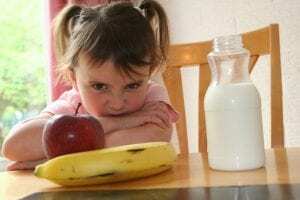 In fact, up to half of preschoolers have exhibited picky eating habits, from wanting their foods prepared only a certain way, to not wanting to try new foods, and to, yes, refusing to eat foods based on color, research has found. This could be in part because as a child’s growth slows between the ages of 2 and 5, most children experience a decrease in appetite, says Carol Smathers, a field specialist in Youth Nutrition and Wellness for Ohio State University Extension. OSU Extension is the outreach arm of the College of Food, Agricultural, and Environmental Sciences at The Ohio State University. “Picky eating may also be part of establishing independence during the preschool years,” she said. “The good news is that as long as a child is growing normally and has plenty of energy, chances are that his or her diet is providing the necessary nutrients. Take your children grocery shopping and let them choose fruits and vegetables. Offer taste-testing opportunities as a way to introduce your child to new foods before they are served in meals. For produce, you can show your child how the food is grown and let your child compare how it tastes both cooked and raw. Include your children in meal preparation, giving them as much responsibility as appropriate for their age and ability. Let them wash fruits and vegetables, measure and add ingredients, or help stir. Talk about how much you enjoy the different foods that are being served and what you like about them. It may also help if you can focus on making mealtime fun and meaningful for your children and family. Ask your kids how their day has gone, or if they did anything fun that day. If your focus is on the foods they won’t eat and how their picky tastes negatively impact the meal, it could lead to unhealthy attitudes toward food and eating habits. However, if you have a lingering concern about your child’s picky eating habits, it’s best not to scold your child or argue with them to eat. You could instead have a conversation with your pediatrician, nutritionist or other healthcare provider about your concerns. ← Holiday Indulgence in Moderation?